If you’re a dog lover, using only the best dog grooming supplies to pamper your pooch is very important! Grooming your dog regularly is essential to help keep his coat and skin in great condition and to help maintain good circulation. Professional dog grooming kits are not just for pro groomers! However, professionals do tend to know what the best grooming supplies are and which products work best. With this in mind, we’ve researched the very best pro grooming tools that you can use on your pet in the comfort of your own home. Before you start shopping for dog grooming supplies, you’ll need to know that different coat types require different dog grooming tools. But before you begin assembling your dog grooming equipment, let’s look at what you’ll need to address your dog’s particular needs. If you have a long-haired breed of dog, you must appreciate that their coats can take a lot of effort and time to keep them in good condition. One essential grooming tool you’ll need for a long-haired dog is a slicker brush. A slicker brush is a wide, flat paddle brush covered in fine pins. The pins can be plastic, rubber-coated, or bare. Slicker brushes are perfect for working through the mats that can so easily form in long to medium length coats. We like the following slicker brushes, good for use on all coat lengths. The HappyDogz Pro Slicker Brush has an ergonomic handle that’s ideal if you have a long-haired pup that takes ages to brush. The bristles are gentle, but firm enough to get rid of dead hair, tangles, and mats. We especially like the Pro Quality Self Cleaning Slicker Brush from the Pet Portal. This brush is of very high quality, so it will last and continue to perform well, even when used regularly to groom the hairiest of hounds! The brush has a self-cleaning button, making it a breeze to quickly clean away shed hair. If your long-haired dog is inclined to get mats in his coat, you’ll need a detangling tool. These are specially designed tools that tease out tangled and matted hair, leaving your dog’s fur silky- smooth and easy to brush. The GoPets Dematting Comb is a well-made, cleverly designed detangling tool that’s one of the best-sellers on Amazon. The double-sided comb has a different number of teeth on each side. The lower density side is designed for use as a dematting rake for stubborn mats and tangles. The higher density side is a detangler tool and undercoat rake, helping get rid of shed hair. The FURminator for dogs with long hair is the most popular de-shedding tool that’s currently on the market. The Furminator is designed to reach deep into your dog’s coat to get rid of any loose and dead underfur, and is particularly useful during shedding season. If your dog is especially prone to developing mats in his coat, you may find it helpful to use a special dematting spray. These conditioning sprays work by softening and relaxing the hair, making it less likely to tangle and mat. Some products can even reduce the amount of brushing necessary by up to 50%! That’s great news if your dog doesn’t enjoy being groomed. Tropiclean Mat Pet Tangle Remover contains only all-natural ingredients, so you can be confident that your dog’s skin won’t react badly to the product. Once a week or so, just spritz areas of your dog’s coat that are prone to tangles and watch the comb glide through the hair like magic! If you’re environmentally conscious, you’ll be pleased to hear that the packaging used with this product is 100% biodegradable. Grooming a short-haired breed is much easier! It’s really just a case of using a slicker brush to get rid of loose undercoat, and then using a bristle brush to lift away any remaining hairs from the top coat, leaving your pet’s fur smooth and shiny. These are some great bristle brushes on the market. Here are our favorites. The GoPets Professional Double Sided Pin & Bristle Brush is a well-made brush that’s of very high quality. The pins are plastic coated and rounded at the ends, so they’ll penetrate deep into your dog’s coat without scratching his skin. The hard-wearing bristles are gentle, yet firm enough to be effective. The HaloVa Pet Comb, Professional Double Sided Pin & Bristle Bamboo Brush is our favorite! It’s also one of the best-selling brushes on Amazon, and it’s easy to see why. The brush is made from sustainable bamboo; it’s comfy in your hand and looks great too! The pins are made from firm but gentle nylon, and the brush itself is created from natural bristle. Wire-haired coats need regular stripping or clipping. Both these processes can be complicated and are best left to a professional dog groomer. However, you do still need to groom your dog to prevent tangles and mats from forming, especially during the shedding season. All of the tools we’ve reviewed so far can be used on a wire-haired breed. 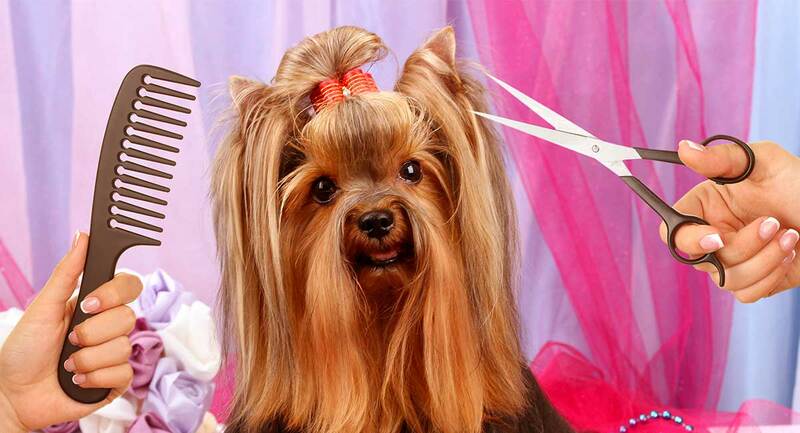 You’ll also need a wide-toothed comb to groom your dog’s facial hair and to remove tangles. The Paws Pamper Professional Grooming Comb is made from strong and durable aluminum that won’t corrode or rust. The comb has wide-set teeth at one end for tackling mats and tangles, and finer teeth at the other end that are ideal for combing beards and mustaches. Curly-haired breeds such as standard poodles have very particular grooming requirements. If left untended, a poodle’s curly coat will twist into tighter and tighter spirals, which you’ll eventually need to have cut out by a pro groomer. Most poodle owners have their pets professionally clipped, but routine brushing between clips is also very important. To thoroughly brush and demat a standard poodle, for example, you’ll need a slicker brush or a pin brush such as those already mentioned in this article. The Poodle Pet Dematting Fur Rake Comb Brush Tool is specially designed to remove mats and tangles in your poodle’s coat, without causing damage to the hair or discomfort to your dog. The comb is made from high-grade stainless steel so it won’t corrode, and the rubber handle makes the tool comfortable to hold. So far, we’ve talked about combs and brushes. But it’s also a good idea to bathe your dog from time to time. Bathing your dog every two to three weeks can help to get rid of dirt, debris, and loose hair. A bath will also remove the accumulated natural oils that your pet’s skin produces, getting rid of that nasty “doggy” smell that’s caused by bacteria feeding on the oils. It’s a good idea to buy a purpose-made dog bath, especially if you have a large breed. A proper dog bath allows you to wash your pet safely and easily, and means that your own bath tub won’t end up full of dog hair! We like the Booster Bath Elevated Pet Bath. This bath is designed for home use, rather than as a piece of professional salon equipment. The bath is sturdy and open-ended for easy bathing and efficient draining. The bottom of the bath has a safe non-slip surface. The legs can be removed for easy storage. To go with your dog bath, you’ll need a Waterpik PPR-252 Pet Wand Pro Dog Shower Attachment. The dog shower is actually classed as a professional dog supplies product and is very popular with pro groomers. Rather than using the old bath-and-bucket method of washing and rinsing your dog, use this cleverly designed shower attachment to speed up the process instead. Simply fix the shower attachment to your home shower or outdoor faucet and rinse away! After bathing your dog, you’ll need to dry him thoroughly before you can brush and groom him. Little dogs can be dried with a soft, fluffy towel. But larger, hairier hounds are more easily dried with a hair dryer. The Flying One High Velocity Motor Dog Pet Grooming Dryer is a brilliant product that can make a massive difference in drying your freshly bathed dog! Professional groomers rely on HV dryers to speed-up the drying process. This compact model from Flying Pig comes with a 10-foot hose, allowing you to keep the dryer away from your dog so that he doesn’t become frightened. The kit includes a set of two nozzles so that you can adjust the concentration of the airflow from the dryer. There’s also a handy filter to keep the dryer from becoming clogged with hair. The dryer operates quietly, too. No matter what breed of dog you own, you will need to keep his nails short. Overgrown nails can cause problems for your pet and for your home’s flooring! If the dog’s nails are too long, they can catch in carpets or in turf when your dog is out exercising. My dog once caught a nail in the ground when she was chasing after a ball, ripping the whole nail out! Although the nail did regrow, it was always crooked and needed more frequent clipping so that it didn’t twist and make her foot sore. When choosing a set of dog nail clippers, it’s vital that you only use a well-made set that are specifically intended for use on dogs. The blades should be very sharp so that they cut the nail quickly and cleanly, and the clippers should have a guard fitted to prevent the nail from being clipped too close to the quick. The Safari 770045 Professional Nail Trimmer is one of Amazon’s top sellers. The clippers are made from high-grade stainless steel, so they won’t rust, and will last for ages. The cutting surfaces are very sharp for a clean cut that won’t drag or split the nail. There’s a safety stop to prevent you from accidentally cutting the nail too short. The handle is designed ergonomically with a soft comfort grip too. Most professional dog groomers prefer to use a nail grinder (dremel), rather than nail clippers. That’s because a dremel gradually wears down the nail without the danger of cutting it too close to the quick. Many dogs prefer the dremel to clippers, once they get used to the noise and sensation. The Hertzko Electric Pet Nail Grinder is a very high-quality dremel with a diamond bit grinder that easily and gently pares away nail overgrowth. The dremel has three different size openings so that you can adjust the grinder to suit your dog’s nail size. There are no clumsy cables to worry about as the grinder is powered by rechargeable batteries. Noise and vibration levels are kept to a minimum, making sure that your dog is not frightened or upset by the process. Grooming your dog is very important for his overall health, as well as for the health of his coat and skin. Different breeds have different coats and particular grooming requirements, so you’ll need to be sure you have the right dog grooming products for the job. In this article, we’ve reviewed the very best dog grooming supplies that the market has to offer! Simply click on the handy links to see other purchasers’ reviews and order your grooming tools. Which grooming tools do you find to be the best for your dog? What breed is he and how do you go about grooming him? If you’re a pro dog groomer, what are your favorite products? Tell us all about your dog grooming experiences in the comments section below.